The Timberwolves and Rockets practiced today at separate locations and the topic of discussion during media sessions at both places: How do the Wolves get -- and how do the Rockets keep -- All-Star center Karl-Anthony Towns more involved offensively. Towns went 3-for-9 from the field and scored eight points in Sunday's Game 1, a night in which TNT analyst Charles Barkley called the Wolves' dumb for not exploiting mismatches after the Rockets switch every screen and a smaller player(s) ends up on Towns. That also leaves, for example, Wolves guard Jeff Teague out up top with a big man such as Clint Capela on him. After practice today, Teague was asked if going one-on-one against Capela is a dream situation for him, Teague said, "Nah, I think that's playing into their hands. They're trying to eliminate KAT. We have to figure out a way to get him the ball against those smaller guys. Get him some deep seals and get some easy baskets." "When it happens, make quick decisions," Teague said. "Tell him to bury the guy in the post. PJ Tucker is the guy most likely to switch onto him and he just got to do what he can do to finish off." The Wolves sometimes Sunday tried to space the floor by sending Towns to the corner. "I think we gave them a steady diet of the same thing," Teague said. "Next game, we got to give them some different looks where KAT actually posts up a couple times and still be able to get our spacing with guys driving and trying to kick the ball, but we definitely have to get him a couple more touches." 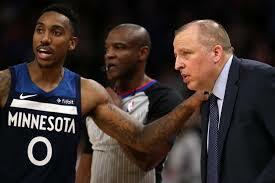 Andrew Wiggins (15), Derrick Rose (14), Jimmy Butler (11) and Jamal Crawford (11) all took more shots thatn Towns' nine. Over at the Rockets, forward Ryan Anderson practiced today for the first time back from a sprained ankle. He called it still a little swollen but said he could play in Game 2 if he went through practice feeling all right. He missed Game 1 because of it.